Welcome to Republic’s family of shredders designed for plastics recycling and carpet recycling, wood grinding, and medical waste markets. Republic engineers wood shredders, plastic shredders, medical waste shredders and pipe shredders. Our products are proudly manufactured in Louisville, Kentucky, USA and backed by the best warranty in the industry. More details, specifications and pricing information Modular Split-a-Part Shredder. 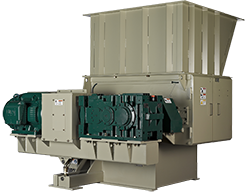 The workhorse of the shredder market – a full featured plastic shredder and wood shredder. The Eagle also handles rubber and medical waste. You’ll find these engineered innovations on The Eagle series shredders – bolt-in removable tool holders, patented guiderail, and overtorque limiting clutch assembly. 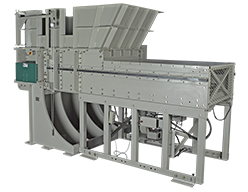 Efficient and cost-effective shredder solution for plastics, wood, paper and rubber scrap. Our Falcon customers are still afforded the most reliable drive train with overtorque limiting clutch assembly and the industry’s best warranty. Innovative, safe & efficient way to process solid and corrugated wall pipe. The fully adjustable Dial-A-Length hopper accepts pipe up to 60 feet long. 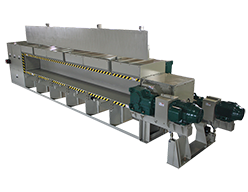 The pipe shredder features a variable speed hydraulic system and accessible easy-clean cutting chamber. The staggered, multi-rotor cutting system, variable speed hydraulic system and heavy duty chain drive churns through pipe up to 66″ OD. The world’s most cost-effective solution for post consumer carpet recycling. Republic manufactures the industry’s only shredder capable of processing carpet for less than a penny per pound. Our carpet shredder sustains throughput at 3-5 tons per hour and delivers more operational uptime and less maintenance down time than any other shredder on the market today. A shredder that makes quick work of pipe and profile, wood, plastic composite lumber, and plastic extruded sheet. The driven feedroll assembly is composed of aggressively knurled solid, one-piece rolls. Input is timed to maximize production output.